When DVD first appeared on the scene, previous formats resorted to using analogue methods of storage such as VHS tapes. The main disadvantage of this was that after watching the film a fair few times, you soon started to notice degradation in the video and audio quality. Just like having a new set of tyres on your car, with each journey they gradually wear down degrading the quality of the tread until eventually they are almost unrecognisable. VHS suffered the same sort of issue. DVD solved this annoyance by storing the information digitally, so even after a thousand times of enjoying your favourite feature film, the quality remained just as if it was your first play-through. Blu-ray is the successor to DVD and although DVD remains a very strong force in movie storage, it is only Blu-ray that offers true high definition video and audio content, perfect for those of us with HD televisions. Blu-ray endured a difficult start to its life though as just like the VHS versus Betamax saga, Blu-ray had to compete with a rival format known as ‘HD DVD’. Just like Blu-ray, HD DVD offered a high definition content solution and there wasn’t a great deal separating the two formats technically either. Blu-ray eventually overcame the competition thanks to a far greater movie studio backing, although of course many early adopters who chose HD DVD were as you would expect left a little disappointed. Thankfully the complications of the format war have faded away into distant memory and it seems a good time as any to write a little guide explaining some of the benefits of this format over DVD and why you should upgrade if you haven’t taken the plunge already. Just like DVD and even the CD format, Blu-ray uses a disk dimension that is identical in appearance. This is great news for the consumer as it means many laptops, desktop computers and external drives now include Blu-ray support and can still offer backwards compatibility with DVD and CD within the same hardware. The important difference though is the amount of information (or data) the new format is capable of storing. DVD can hold up to a maximum of around 8.5GB (gigabytes) and although this worked out very well for our video and audio requirements a few years ago, high definition content of the highest quality requires far more, especially when you throw in additional features. Blu-ray can store around 50GB, which is a massive leap over DVD with nearly six times the amount of available space. Blu-ray presents the vast majority of its titles in 1080p (1920×1080 resolution with progressive scan), which is sometimes known as ‘Full HD’. Without getting bogged down by explaining what every aspect of this means, this essentially allows you to enjoy a picture quality with up to five times more information displayed on your HD television screen (specific to UK), giving you a crystal clear movie experience, far superior compared to that of DVD. If your HDTV isn’t 1080p compatible, there is no need to fret as all high definition televisions will benefit from Blu-ray. Another nice addition to this format is that movies can be shown at their true 24 frames per second rate. When films are recorded and edited for release in the cinema by the large movie studios, they are set to this standard. In the past, purchasing a DVD resulted in you actually viewing a slightly adjusted frame rate to be compatible with existing players and televisions. With a compatible HDTV, you can experience a far smoother production, exactly as the creators intended. This is often shown on compatible televisions as 1080/24p. There is always a lot of discussion and promotion of high definition video, however the same can’t be said regarding high definition audio. Just like HD video, HD audio takes the quality of the sound to a much higher level and for the very first time for home consumers, a true studio reproduction. By this I mean that when those clever movie creators sat down in front of a huge mixing desk, tweaking hundreds of settings and finalising it all for the cinema, with a compatible HD audio surround sound receiver you can enjoy an exact copy of their creation with no loss of atmosphere or even more importantly, no loss of quality! There are various HD audio formats including Dolby Digital True HD, DTS HD and other variants, all capable of up to 7.1 channel surround sound goodness. Interactive menus can be viewed and selected all while a movie is still playing, however there is much more to Blu-ray than just this. DVD movies often came loaded with special features including interviews, behind the scenes footage, bloopers and the most basic of games. Blu-ray takes this idea forward by adding picture-in-picture capabilities, which is a little like an audio commentary running in the background during a movie explaining the films production, however this time a video window can appear in the corner showing the discussion and behind the scenes montages, all while the movie is still playing. Very handy for keeping all the information in context. Newer Blu-ray players can also connect online, accessing additional content specific to your movie, often adding further special features and some even have the ability to play YouTube videos directly to your HDTV. Programmers have a lot more flexibility with Blu-ray to create a whole new world of special features and even though the format has been out for a little while now, I am sure there is still a lot more to come in this area. Blu-ray will be the format that takes advantage of 3D content. You will have no doubt noticed many of the cinemas offering 3D versions of films recently, equipped with a set of glasses that gives the impression of depth within a movie. The effect is impressive and will be coming to homes very soon thanks to a new breed of 3D compatible Blu-ray players and HD televisions. Blu-ray is the true successor to DVD, presenting a vastly superior picture and audio quality in high definition, which until now had been an unobtainable enthusiast’s dream. For the first time, you can enjoy a movie far closer than ever before to how the directors and editors intended, creating a cinema-like experience right in your home without the annoyance of strangers rustling popcorn or sending text messages with their mobile phones. Hopefully this little guide has explained a few of the basics regarding Blu-ray, however in later guides I will cover many of these sections in far greater depth. 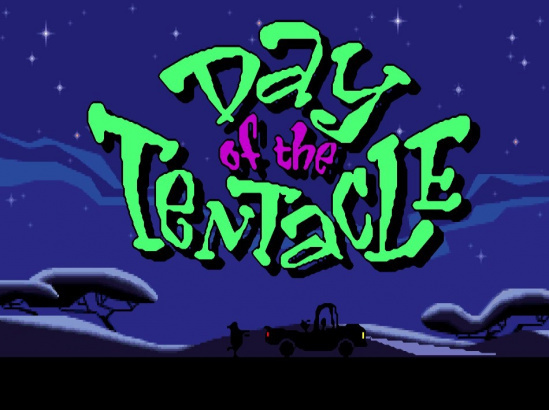 ← Previous Day of the Tentacle – When an Evil Purple Tentacle Tries to Take Over the World!